Keeping with the idea of engaging with schoolchildren, James Sladden, a history teacher at Queen Elizabeth Grammar School on Wednesday launched the Centre’s essay writing competition for Year 7 and 8 pupils at the school. 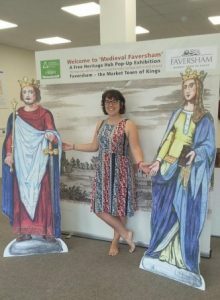 The competition has two strands, a short story or a research piece that takes as its inspiration items in the ‘Medieval Faversham’ exhibition that opened today at 12 Market Place, Faversham – the town’s new ‘Heritage Hub’. Dr Diane Heath, her son Harry and I put the final items up yesterday, to which were added two of the town’s charters today. These are the town’s copy of the 1300 Magna Carta and its charter about the town’s privileges granted by Henry VIII. There will be more on ‘Medieval Faversham’ in the next blog because I’ll be joining Diane and Dr Pip Gregory next Saturday when the exhibition will be open again to the public – please do come and join us, the exhibition opens at 10 am and ‘young medievalists’, please bring a responsible adult, can start making ‘medieval’ items from 11 am. 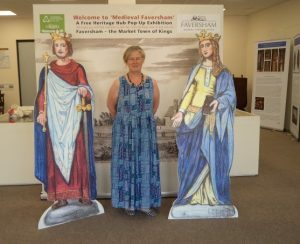 This week Diane was ably assisted by Harriet Kersey, who very nobly agreed to help with these ‘Young Medievalists’ Corner’ activities even though she was recovering from a hectic time at the Leeds International Medieval Congress 2018. This medievalists’ conference had included a large number of postgraduates from Christ Church and several staff members from both History and English. I don’t have room to go into detail about all the presentations these postgraduates and staff gave at Leeds, but I will give you a roll call of everyone this year. To avoid any sense of hierarchy, I will run through the list in the order in which they appeared in the programme, in other words from those who gave papers on Monday to those who gave presentations on Thursday. I shall begin with Dr Michael Bintley, who has just left CCCU to take up a post at Birkbeck. Mike’s topic was Eanswythe’s landscape or what the project team is beginning to discover about 7th century Folkestone. Dr Leonie Hicks joined him in this Monday morning session where she spoke on how Norman history writers created what she calls a ‘miraculous landscape’. 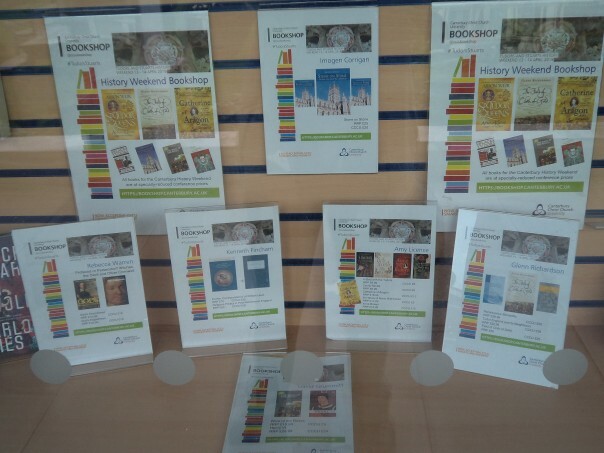 Tuesday afternoon saw two papers by CCCU History postgraduates. Lily Hawker-Yates considered the memorialisation of burial mounds by early and post-Conquest poets and chroniclers, including the case of King Harold’s burial said to have been under a mound overlooking the sea near the site of the battle of Hastings. 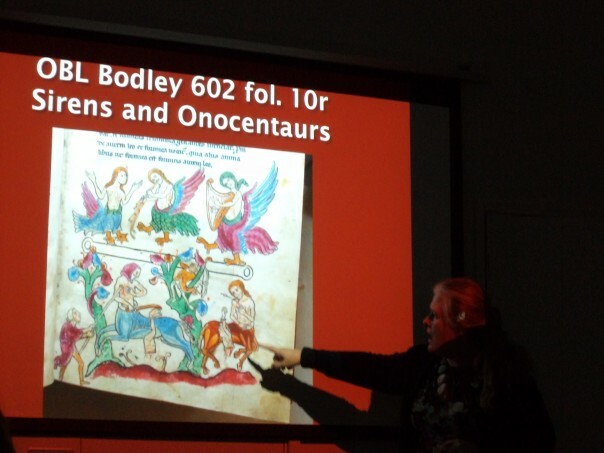 The other speaker that day was Harriet Kersey who discussed the case of the abduction of Eleanor de Ferrers and what this case can tell us about dower for 13th-century noblewomen and their considerable vulnerability from predatory aristocrats in search of land. The following afternoon it was the turn of Dean Irwin who examined the activities of a 13th-century Anglo-Jewess. That same afternoon Andrew Connell took us back to aristocratic considerations when he explored the affinity of the de Lacy Constables of Chester and the Earls of Lincoln in the 13th century. And in the same session Adrian Jobson investigated Richard of Cornwall and the reconciliation process post the battle of Evesham. Thursday brought the final three papers, I explored commemoration narratives using William Browne’s hospital in Stamford, Lincolnshire as my case study, Abby Armstrong examined the surviving letters of Henry III and his daughter Princess Beatrice, and Charlotte Liebelt discussed royal authority in terms of the Norman Conquest as seen in 12th and 13th century English literature. As you can see from this diverse and fascinating range of topics, medieval studies are alive and well at Canterbury Christ Church. This brings me to the Medieval Pageant where the Centre was based at the Greyfriars Gardens off Stour Street once again. Professor Louise Wilkinson was ably assisted by Dr Paul Dalton and me, and a large band of history students from Christ Church (in no particular order): Hollie Cleaver, Alisha McDonagh, Rebecca Capper, Sam Jaconelli and Sienna, Chloe Luxon, Holly Bringes, Michael Byrne, Nicole Custer, Victoria Mitchell, Andrew Leach (a regular Centre stalwart) and Amy Licence. 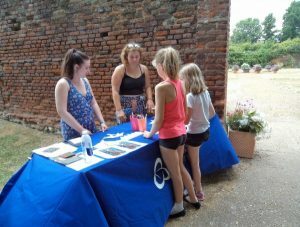 Victoria were happy to dress in period costume and really looked the part, and as well as helping at the Greyfriars Garden some of the students helped at other venues on the family trail around the city, such as Eastbridge Hospital and the Westgate Towers. Canterbury welcomes the first two giants. As in previous years the pageant itself drew large crowds as it made its way from the Westgate Towers to Rose Lane and finally ended outside the Marlowe Theatre. The number of giants is steadily increasing and this year there were five. 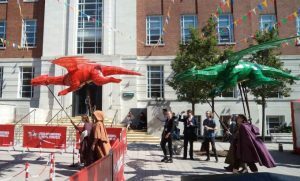 This was great but I’m still waiting for St George and the dragon because this was one of the pageants performed in Canterbury annually on 7 July in the later Middle Ages according to the documentary sources. 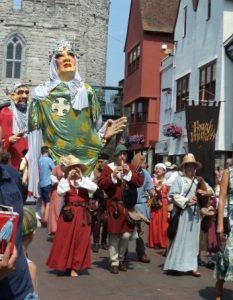 The St Thomas pageant also used a puppet for the saint and it would be great to see his reappearance, especially because the timing of the modern pageant relates to the feast day of St Thomas’ translation, an event that took place in 1220. Sandwich, too, seems to have had a puppet of the ‘villain’ Eustace the monk, probably a giant, in the later Middle Ages if not before which was presumably paraded through the town on the feast day of St Bartholomew – marking the saint’s intervention on the side of the English against Eustace and the French at the Battle of Sandwich in 1217 and the (re)foundation of the town’s St Bartholomew’s Hospital. Chloe and Holly helping young medievalists create their stained glass window. To return to the Centre’s presence in the Greyfriars Gardens, the Centre’s child-friendly activities this year were design your own shield, make your own stained glass window and design your own crown. I think the stained glass window activity was the most popular but the other two also attracted very good numbers and for each of these activities there were some brilliant pieces of work. Although primarily for children, several adults couldn’t resist having a go, and the same occurred at Eastbridge Hospital where the activity was make your own pilgrim badge complete with bell. Both stations of the trail did well for visitors and over 670 people came into the Greyfriars Gardens, often in search of that all important stamp on their cards towards a large chocolate coin – a minimum of 5 stamps (stations) required from around the city. Also stationed in the Greyfriars Gardens was Marion Green, the education officer at Canterbury Archaeological Trust, whose display included a scale model of Canterbury Castle – always popular, several archaeological finds including a goat’s skull, a Roman lamp and some of the contents of a local medieval cesspit – good for environmental finds such as fruit stones and evidence of parasites that lived in the guts of medieval people. The fletcher discussing his trade. 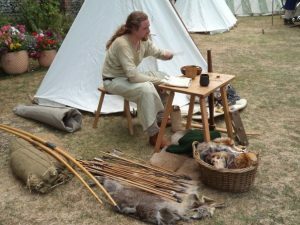 Another way of learning about the past is through experimental archaeology as practised by re-enactors, the Milites de Bec group, who are very careful to make and use materials as they would have been used at particular times in the Middle Ages. As last year the Centre was lucky enough to have the re-enactors’ village, complete with the two mounted knights stationed in the Gardens. This meant that after they had returned from the Pageant, they were very popular among visitors to the Gardens who were able to watch spinning and needlework, talk to a ‘brother’ of the Knights Templar, find out about medieval knights and their horses, and learn more about the work of fletchers, including the finer points of arrow making and the varying wounds such arrows could cause, as well as how these wounds from longbow arrows differed from those by crossbow bolts. Considering this afternoon coincided with the England football match and yet another swelteringly hot day, the numbers and obvious enthusiasm were great to see, and the Medieval Pageant seems to be going from strength to strength, which is excellent for the city and the involvement of Christ Church’s growing band of medievalists! And next week it will be ‘Medieval Faversham’.